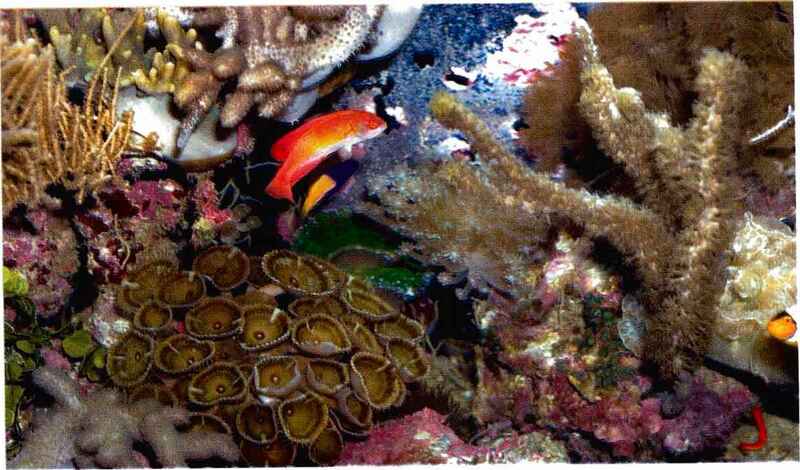 In Volume One we featured some photographs of reef aquariums from around the world. 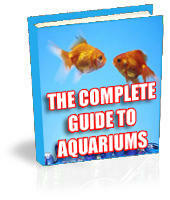 This was a popular section of the book, so we decided to do it again in Volume Two. 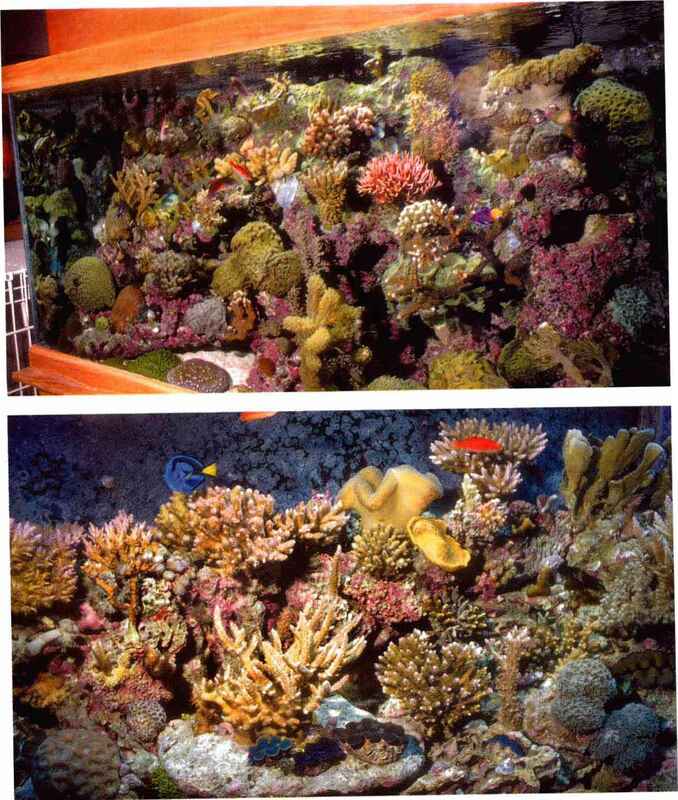 We were amused to discover that the appearance of reef tanks has markedly transformed in the few years since our first book was published. 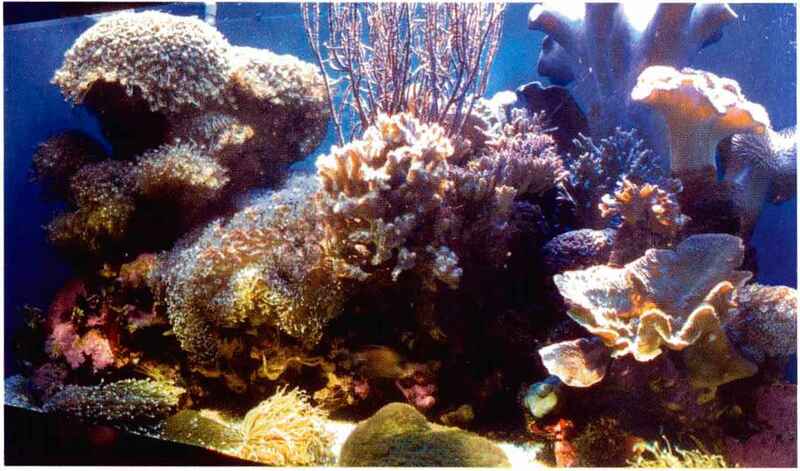 The trend lately is to have a reef aquarium full of small-polyped stony corals. 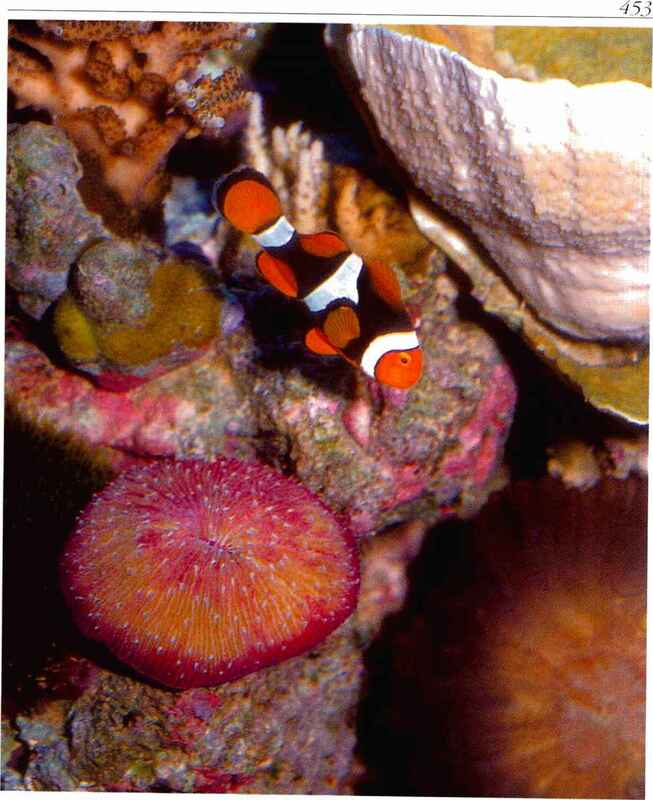 Volume Two is about soft corals and anemones, so the aquarium photographs here tend to emphasize the wrong creatures for this book! 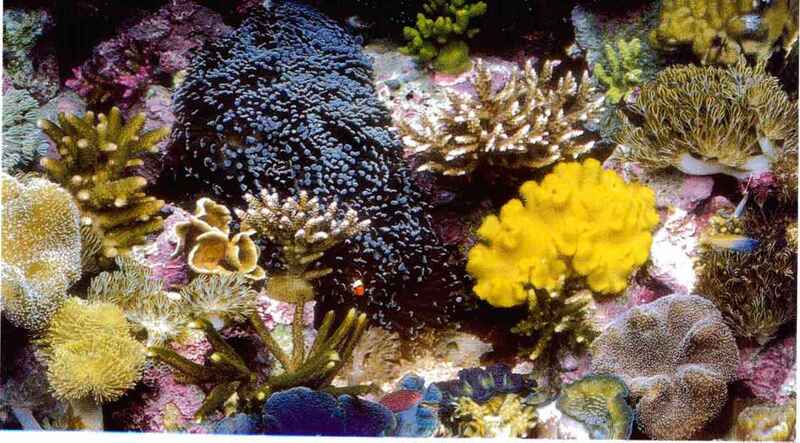 While the small-polyped stony corals are certainly challenging to grow and colourful, they lack the fluid motion provided by swaying soft corals or anemones, which can be more interesting to observe. 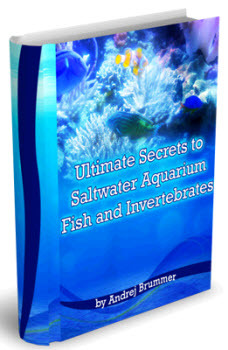 We hope that the information provided in this book stimulates a renewed interest in the great variety of soft corals, anemones, and anemone-like creatures that really provide interesting movement and diversity of shape to a reef aquarium community. 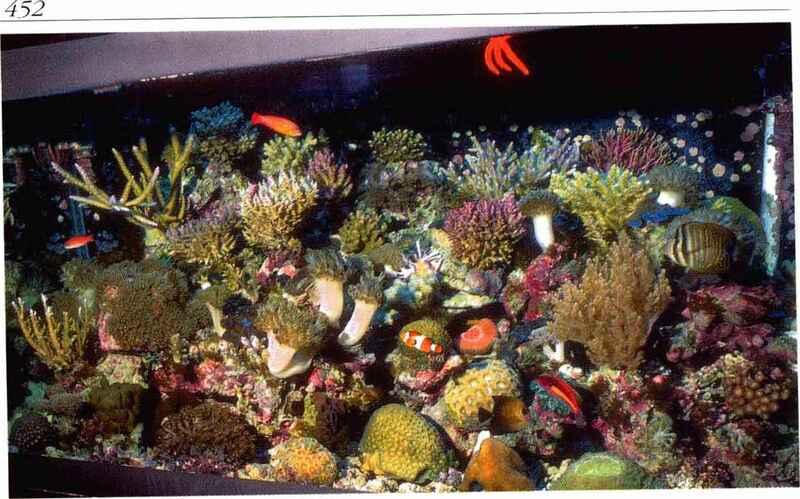 With this tour of beautiful reef tanks we hope to inspire the reader to develop new ideas about reef aquarium construction and the communities established within a reef aquarium. 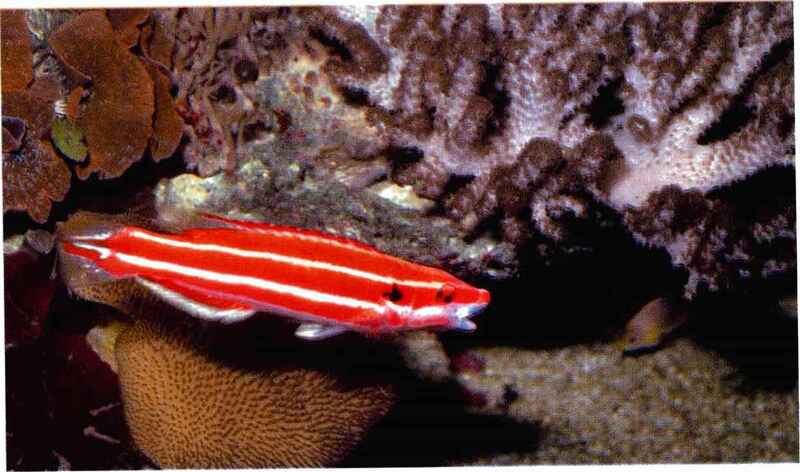 More information about the next group of tanks can be obtained by visiting the Waikiki Aquarium homepage on the world wide web: www.mic.hawaii.edu/aquarium. 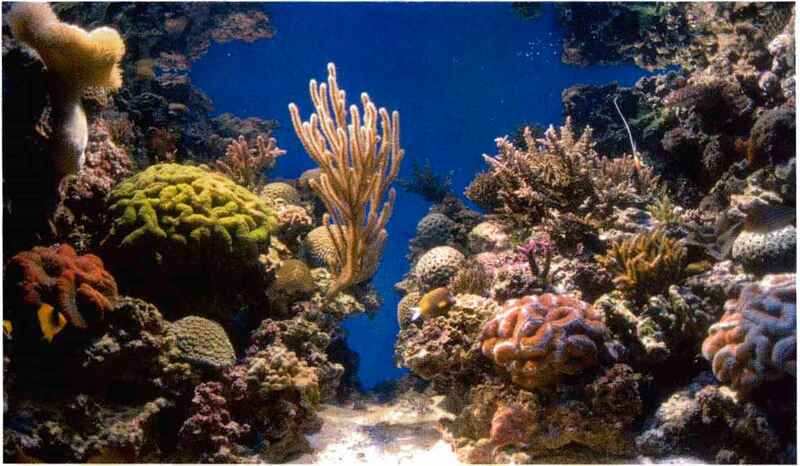 The Edge of the Reef is a 26600 L (7000 gal) outdoor exhibit that reconstructs a typical Hawaiian shoreline. 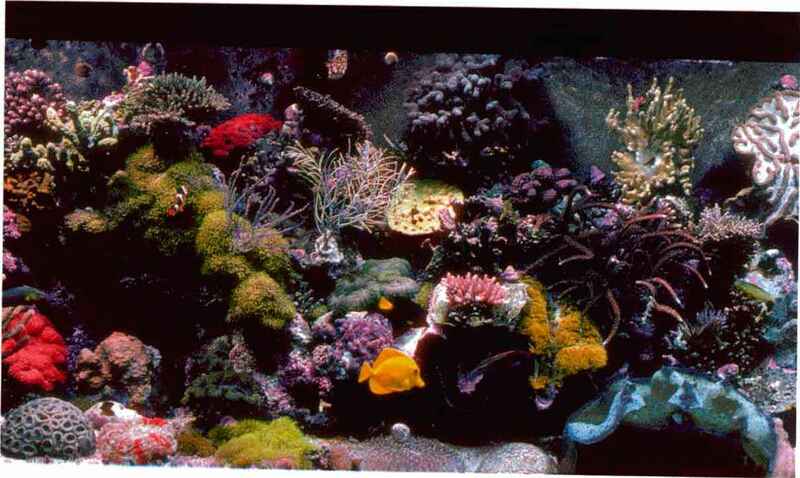 Established in 1987, it contains many of the original fish and corals. 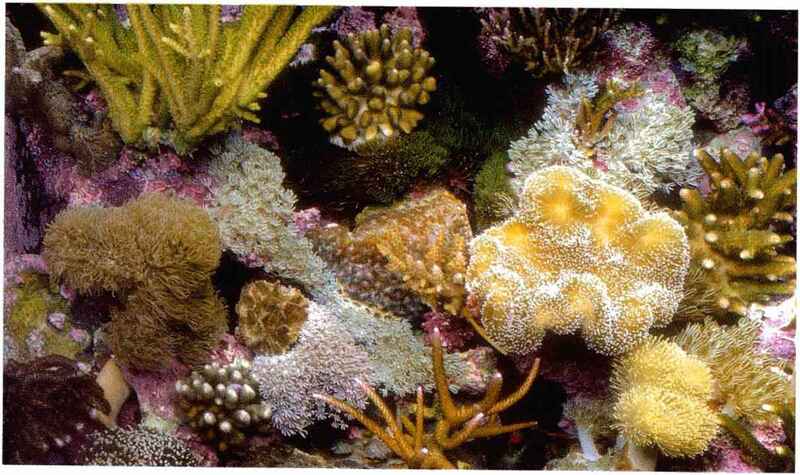 Large heads of Montipora verrucosa and Pontes lobata have grown. 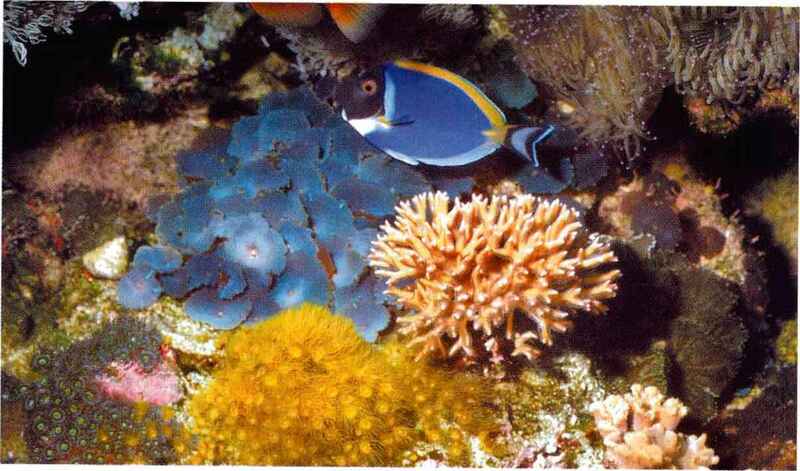 The Montipora spawns each June a few days after the new moon. 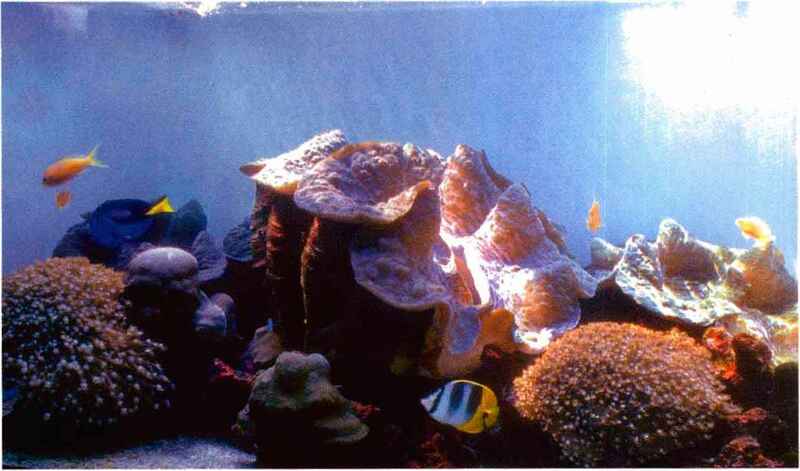 Filtration: 3 rapid sand filters and 3- 2HP pumps. 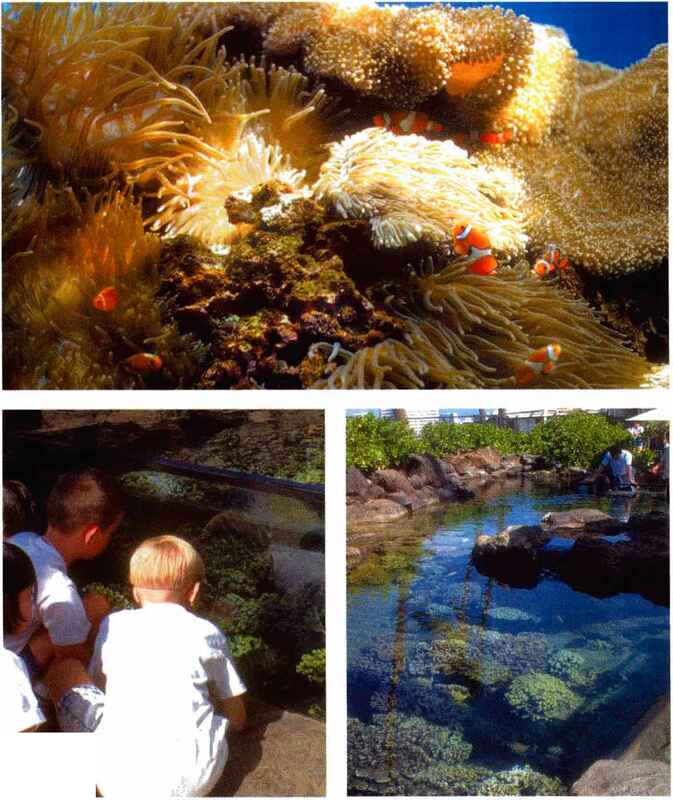 Water jets in the walls of the exhibit provide circulation and a 950 L (250 gal.) surge tower empties every five minutes. 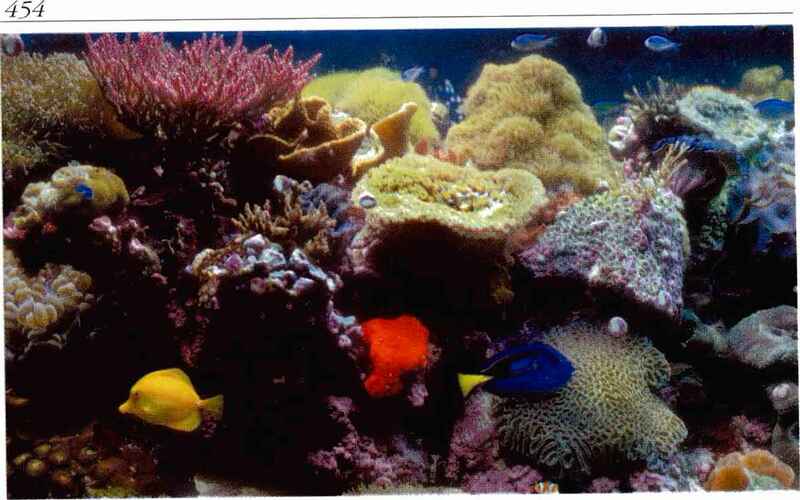 Natural seawater enters the filtration system at the rate of 2280 L/h (600 g/h) and the exhibit overflows to the ocean as well as recirculating through the sand filters. 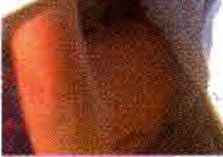 J. C. Delbeek. 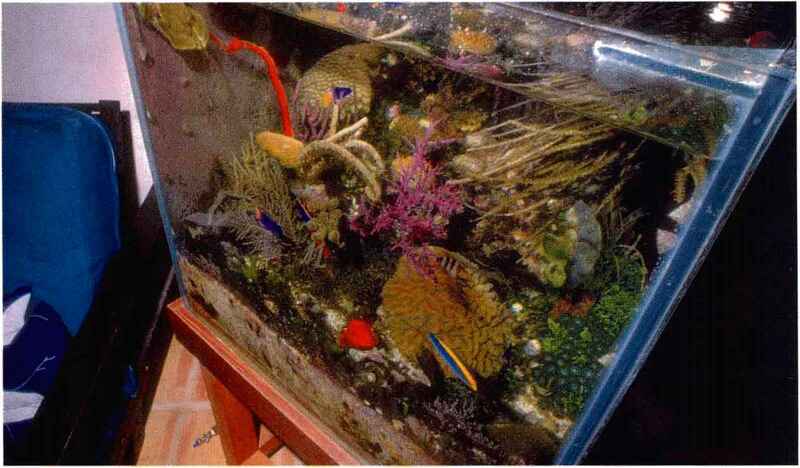 Top view of Julian Sprung's 15 gallon reef aquarium with a mangrove tree growing out of it.